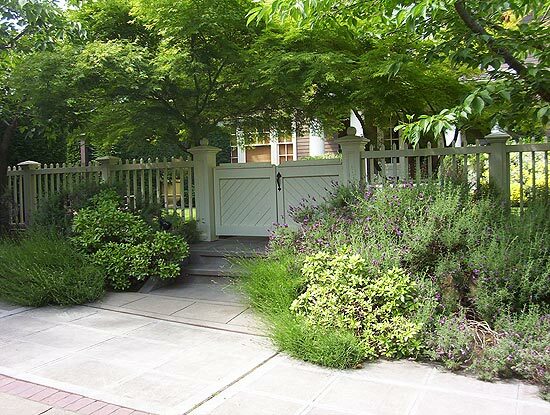 Designed by Talley & Kolb, this garden on north Capitol Hill surrounds a large New England-style house set so far back on a flat corner lot that, while having an ample side yard, effectively has no back yard. This problem was amplified by the fact that the fourth side of the lot borders an alley and the tall surrounding houses all have a clear line of vision onto the property. 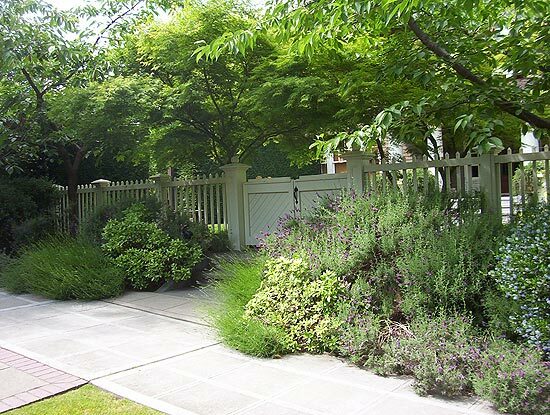 The clients, a family with several small children, wanted to find a way to turn the two side yards in usable private space for family living. 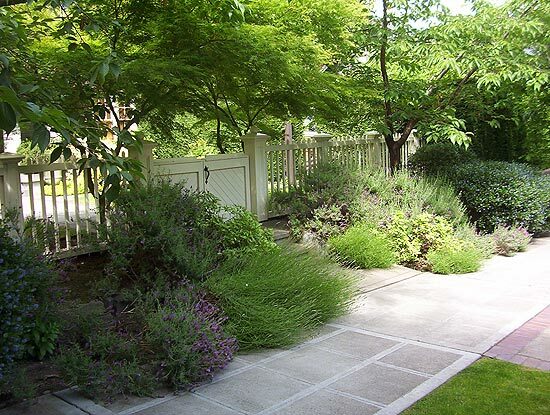 Working closely with Bill Talley, Seattle Landscape Architect Brooks Kolb chose to split the front garden into three distinct sub-spaces; the use of each space directly follows the sequence of rooms within the house. 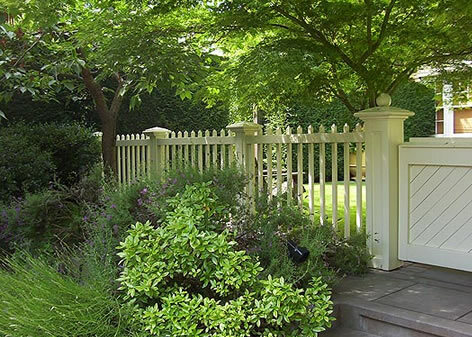 The central lawn, opposite the front entry hall, is set off from the street with a low, open wood fence above two concrete steps. 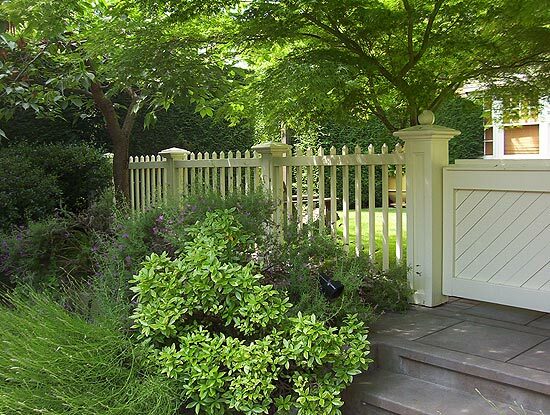 This fence establishes privacy while at the same time visually welcoming visitors into the garden. 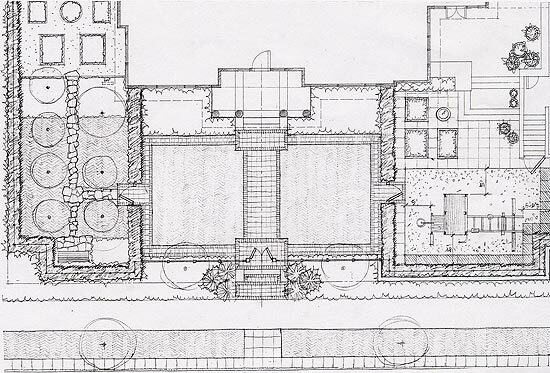 The other two spaces, flanking the central lawn, are walled off with tall hedges of Leyland Cypress for maximum privacy and are entered through two tall wood gates, painted forest green, which face each other across the central lawn. 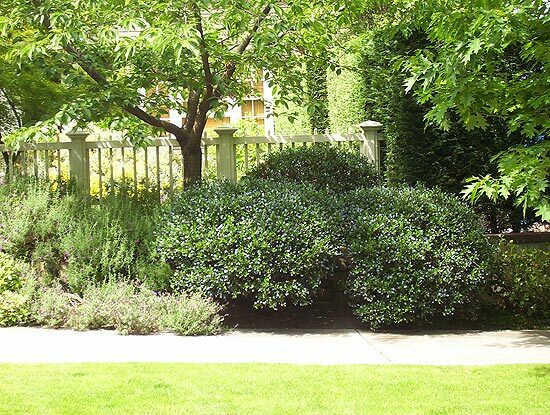 On the west, facing the living room, is a formal lawn with an orchard of fruit trees and a small rose garden. On the east, facing the kitchen and family room, is an outdoor dining terrace and children’s play area. Since the clients were concerned that their small children might run into the street, chain link fences were installed first and the hedges were planted on both sides of the fences. 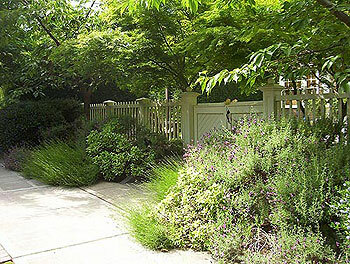 After a year or two the fences became completely invisible.